It's one thing to apply a known set of rules to a new situation, as is done in Quantum Mine. Patternmaster is about making a discovery--encountering a new environment and figuring out the rules themselves. Nonetheless, the scientific approach is your ally. Something to pay attention to here: are all questions/approaches equally effective or efficient. Once you're 'in', you'll see the cards and their 'state indicator' (a green 'thumbs up' or red 'thumbs down') appearing below indicates whether each is 'happy' or not. Happiness is based on a cards own appearance and that of a nearby card. Drag and drop the cards to move them around. Your goal is to figure out HOW to make the cards happy (green/thumbs-up indicator), by deducing theunderlying rule at work. Just making the cards happy without figuring out the rule will result in no credit. Full credit is received for satisfying the 'checking' function of the program accessed via the 'Test hypothesis' button. 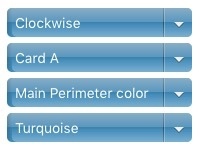 Note that different total points are achieved for Easy, Medium, and Hard puzzles. These are shown on puzzle completion. If, having solved one of the easier (no bonus points) problems, you want to try one of the more difficult ones, you can store such work using the 'Save for later' button. 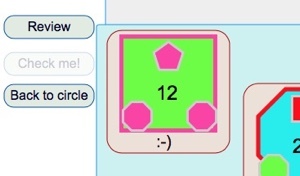 If you complete and understand such a puzzle, you can upgrade it to homework (point-getting) status simply by clicking the 'Store for Grade' button when the solution is displayed. Review: The 'Review' features shows the upper righthand corner of the circle to aid memory on the 'Test Hypothesis' page. The 'cards' can be dragged and dropped onto one another in order to test hypotheses about which ones are being 'made happy' by which characteristics. Note that there are four more cards than are required to complete a pattern, and that you needn't get all 8 cards 'happy' to demonstrate understanding of the pattern. Indeed, having them all 'happy' actually gives you less information than having some happy, some not. When you have at least 6 cards in the green/thumbs-up mode, the 'Test hypothesis' button becomes enabled. You're now enabled (though not required) to advance to the Room of Proving! When you have established cause-and-effect through experimentation (and inspiration), you progress to a testing area. Your task here is to design several cards utilizing the rule you have deduced by moving cards on the Circle page. Now you'll design two pairs of cards. 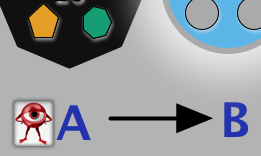 On the right, you have a completed card (A) and you are to design the card it is 'looking at' (B) with just enough features that it 'satisfies' card A according to the underlying rule (the 'eyeball' icon is to remind you that card A is 'looking at' card B'). [Note that these relationships will be reversed in the 'counterclockwise' case; further, if more complex rules are added, you may be taken to a more freeform page to prove your understanding. You designate the characteristics of card using the menus below the 'Set Direction' menu. Once you have completed all four 'designer' cards and made sure that you have all necessary information on each, and no more information than is sufficient, click the 'Check me!' button. At this point, you will only be told if you are 100% correct or not. This is a problem for you to solve by thinking and testing!